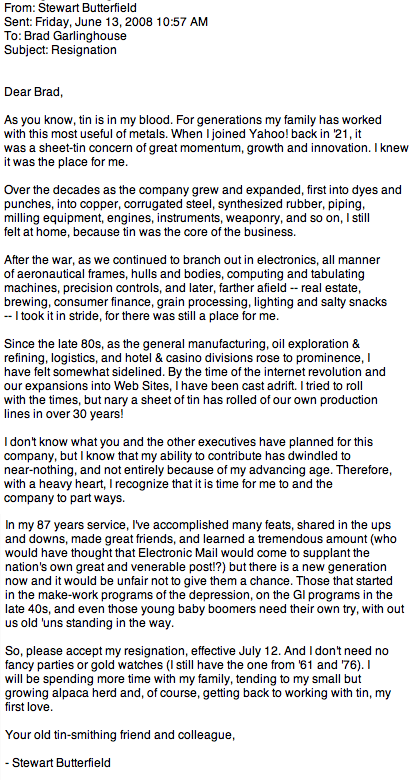 The always enlightening Grant McCracken pointed me to this brilliant resignation letter from Stewart Butterfield (co-founder of Flickr) to Brad Garlinghouse at Yahoo! (Yahoo! bought Flickr in 2005 for $35 million.) This letter is almost as good as the final episode of The Soprano's. I think this guy read one of my cover letters---seriously.